• Are you tired of mowing, or paying someone to do it? • Are you sick of unsightly weeds that just keep coming back? • Are you sick of lawn that’s boggy in the winter and brown in the summer? • Are you dreading unaffordable bills due to grass watering? • Are you ashamed of a mottled garden with inevitable bald spots everywhere? Artificial turf can solve a multitude of problems that you may have with your natural lawn. It can eliminate the hassle of mowing, weeding, fertilising and watering. With the installation of our artificial grass for home landscaping, you can forget the pain and suffering induced by natural lawns. Enjoy lush, green grass that looks so real your neighbors can’t tell the difference – all year round. Our different turf options imitate the curled structure and varied color of natural grass to make it look amazingly real. Whether you want short pile for the manicured look, or long pile like a meadow, there is an option to suit all gardens. Safe for kids and pets – our artificial grasses contain no nasty chemicals or heavy metals. 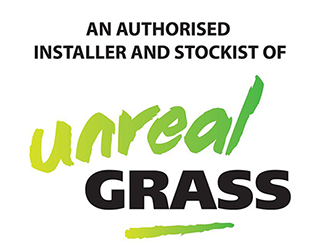 We are delighted to be the prefered installer in Christchurch for Unreal. To find the right product for you, head to Unreal.